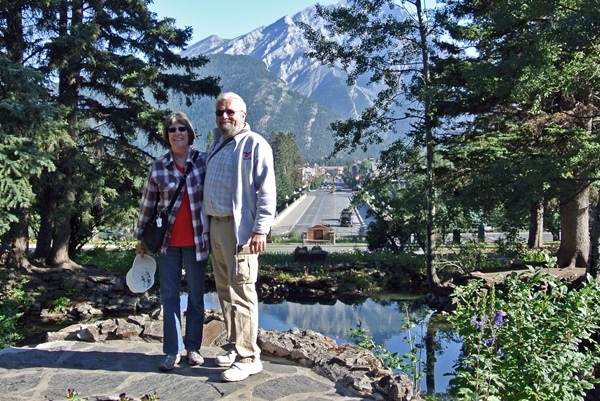 We found both of the tours we took while in Banff to be very worthwhile. The tour guides were great. We were able to see much more than would have had we just driven around with a guidebook and map. It was easy to just get on the bus and ride while someone else did all the work. Most important though, was that the parking lots at almost all the stops were full. We saw people parking along the road and walking over a mile in some cases just to get to where we got off the bus!! 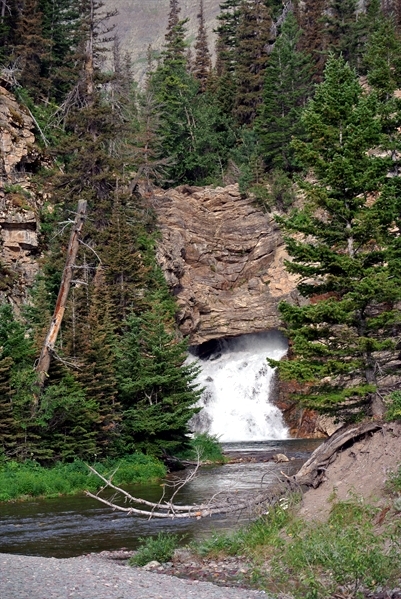 We took a short hike up to this outstanding waterfall. Our driver and guide took our picture. I think he did a great job. Every bit as beautiful as all the postcards make it out to be!! 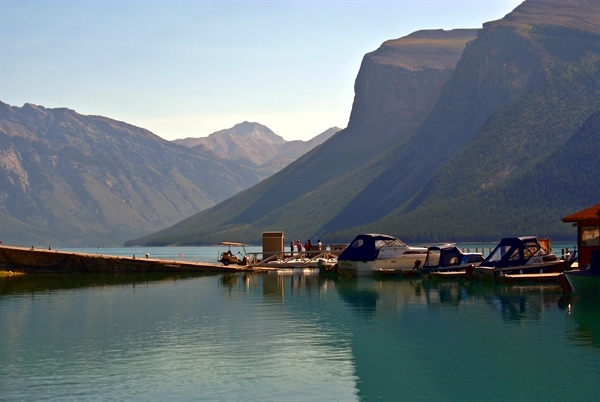 We sat along this shore and ate a picnic lunch we had gotten at the Lake Louise Hotel deli. Can you imagine a nicer place for lunch? 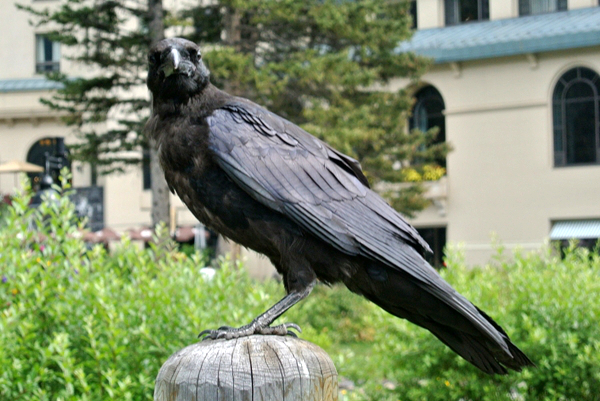 I don’t know if he was more interested in us or our lunch, but in any case we weren’t sharing. He sat so perfectly still for his portrait that he looks like a statue. 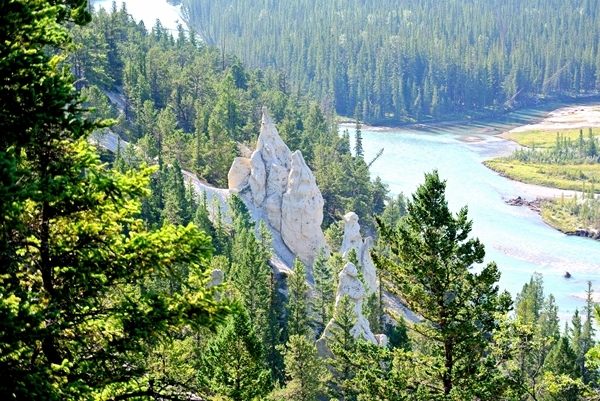 A short but very steep trail led us up to this outstanding view. It was much easier returning to the bus than going up. I have left out some interesting stops on the tour only because I was unable to get telling photos. 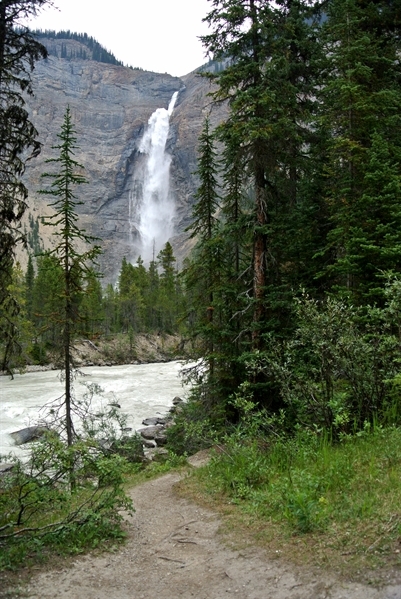 But this 836 foot falls made a fitting end. We were tired when we got back and had not done any of the work. It was all fun. We drove ourselves to the Gondola and as it was early morning we had plenty of room to park. What a fantastic ride up to some unbelievable views. 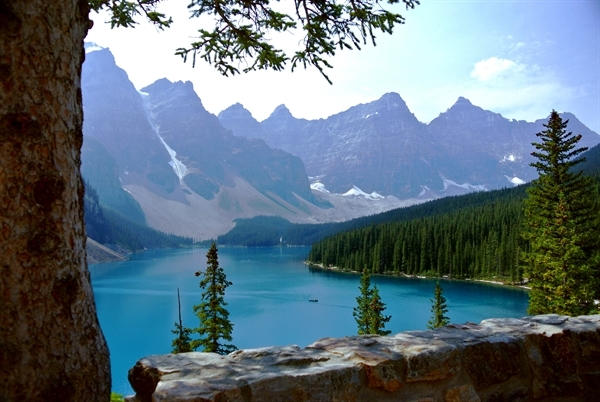 Banff was an unforgettable stopover on our travels. 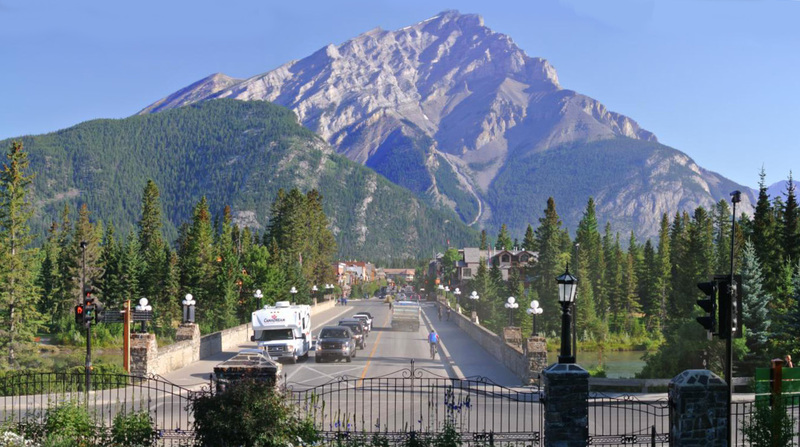 Banff, Alberta is as far north as we are going on this trip and it was worth every mile/kilometer of driving that it took to get here. 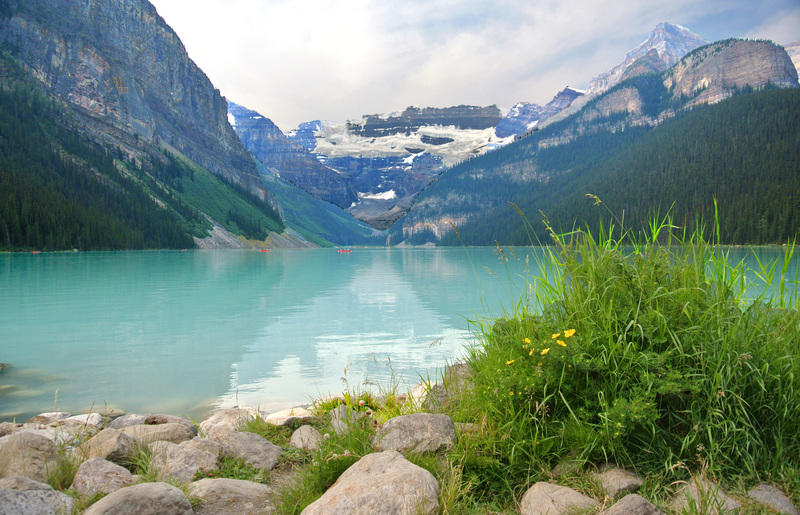 This absolute grandeur served as our greeting after a trying day of driving which included Calgary, AB where some of the drivers seem not to have grasped the concepts of civilized driving and obviously believe that they are immortal. 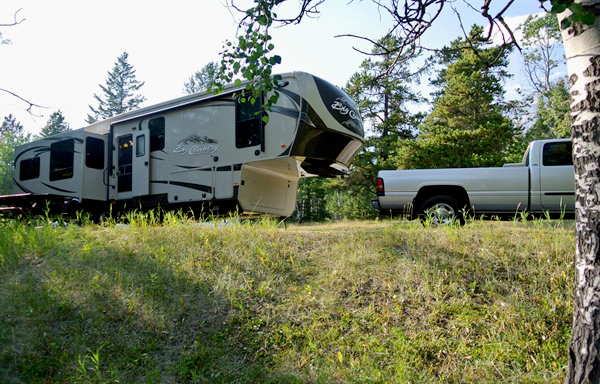 Tunnel Mountain Trailer Court is a beautiful campground that I would highly recommend. 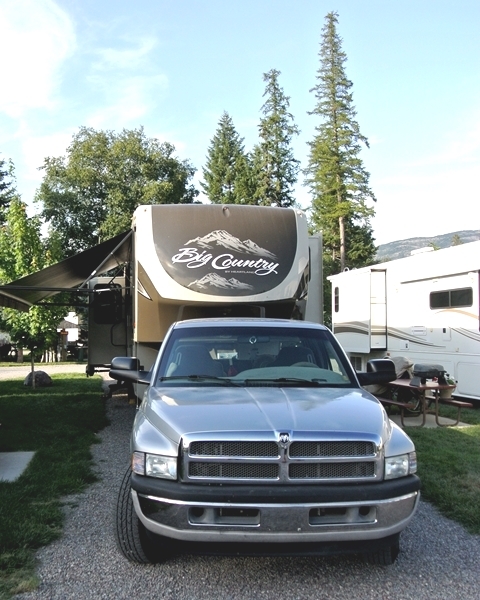 The sites are open with easy pull-through access, have trees for shade, and, especially in the 800 row, have wonderful views of the surrounding mountains. 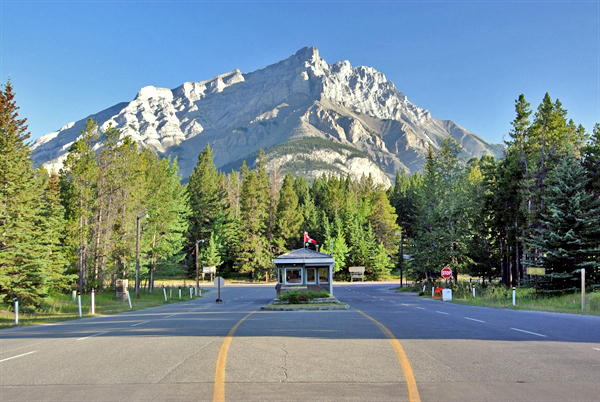 The campground is a very short drive from the town of Banff and city bus service is also available. It served us very well as a base for seeing all the sights. We took 2 tours while we were here. The first was a half day that included the highlights in and around the town. 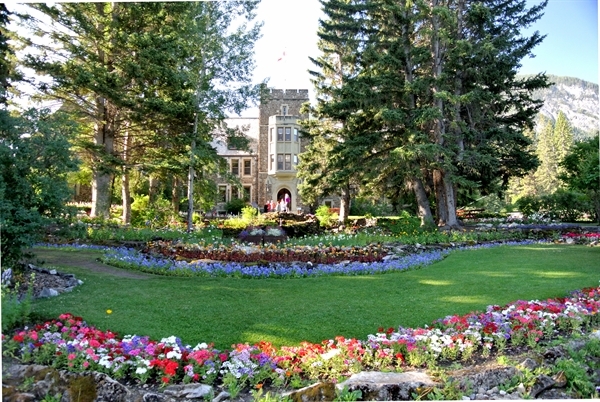 This view of downtown Banff is from the Park headquarters which has beautiful gardens. 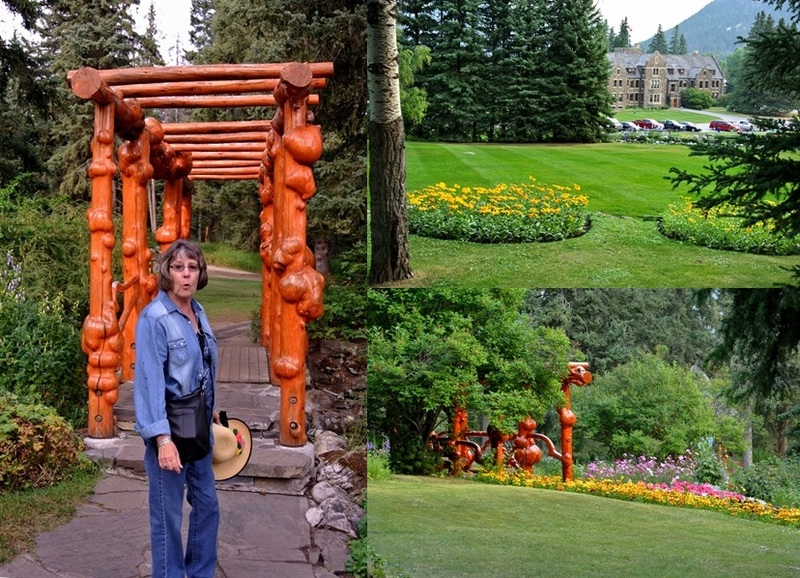 We did some tourist type shopping in Banff and in the neighboring city of Canmore including two farmer’s markets/craft fairs and found lots of fun shops with interesting wares. We bought a few things including a small indian dream catcher for Bertha. 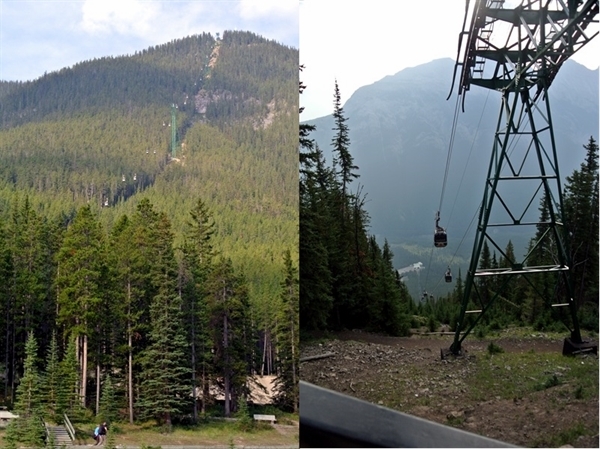 From the view of Banff above I turned 180 degrees to take this picture. This is only a few of the many flower beds at the park headquarters. Elaine and I toured most of them on another day. 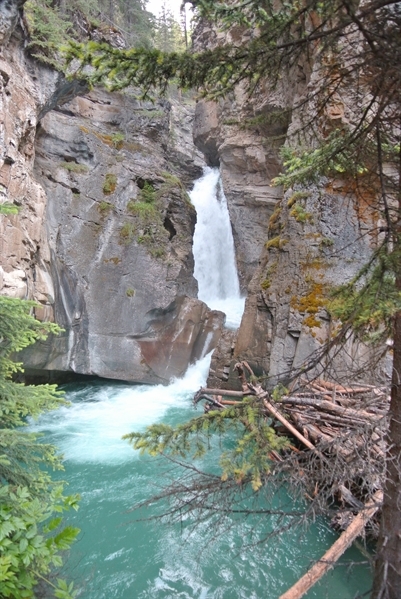 If you come to Banff this is a must see stop that we did not see mentioned anywhere. Maybe because it is free. I took enough pictures to bore most people so I am only publishing a small sample. 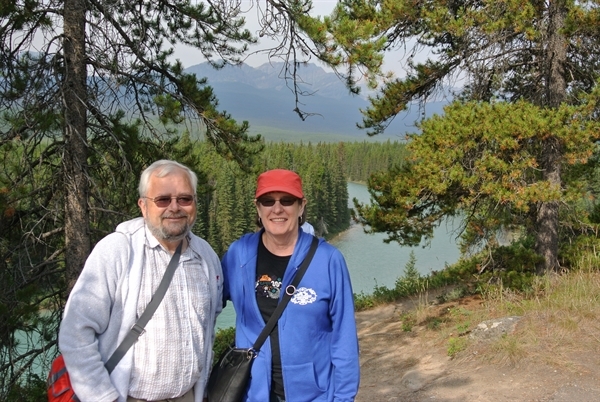 I will post our second guided tour (lakes and waterfalls) and our trip on the Banff Gondola in separate installments as this is getting quite long. 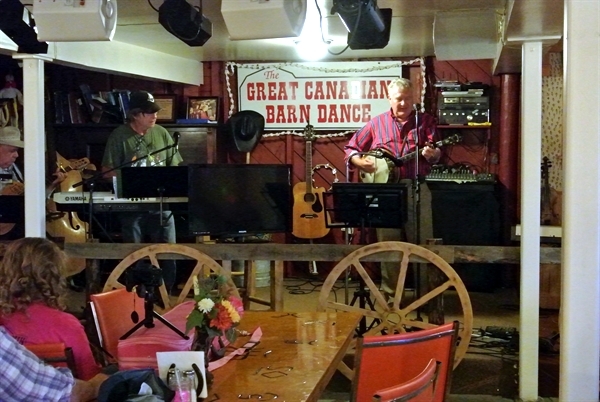 While planning this adventure on the web we ran across this place called “The Great Canadian Barn Dance” that sounded like it was much more “our style” than any of the giant amusement parks that just don’t interest us and decided that since it was “on the way” we should stop and check it out. I took this panorama right outside our front door!!! This Alberta farming area is very much like its southern neighbor Montana. 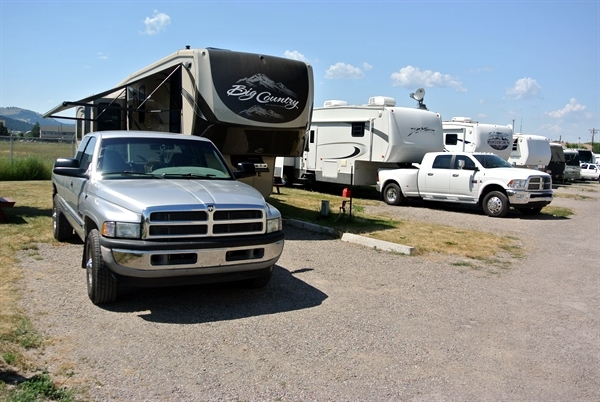 On the next day because it was our first full day in Canada we needed to do a little shopping in town for all the things we did not try to take across the border and then we took a walk around the campground. 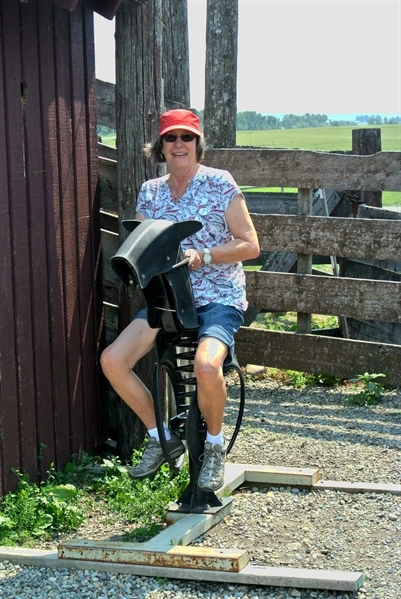 As you can see Elaine rode part of the way. An ice cream social / jam session one afternoon with a dinner show (excellent entertainment and plenty of great food) one night. 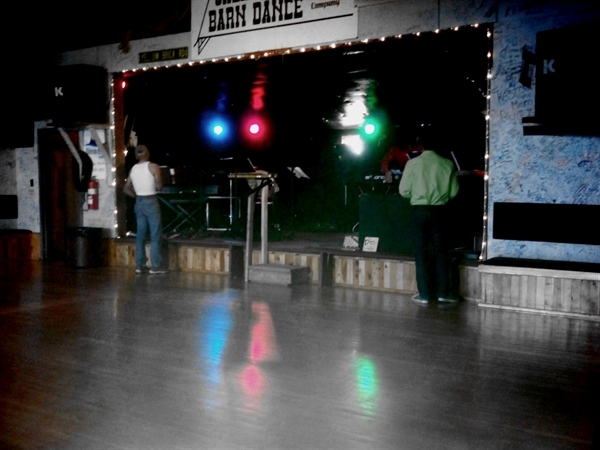 And finally an evening of country dancing on a huge well kept wooden dance floor made this an enjoyable stop on our way to Banff and Lake Louise. We moved on from Heyburn having enjoyed our time there. Great park, great people and lots of great scenery, but it was time. When we arrived, much later than planned, all the sites were taken. The lodge fixed us up with a temporary site where we had power and the next day we were able to get into a regular site. Great folks. Thank you brother/sister Elks. We spent a couple of days shopping, getting prescriptions filled and just plain bumming around. We found Kalispell to be a friendly modern city with very pretty older neighborhoods. 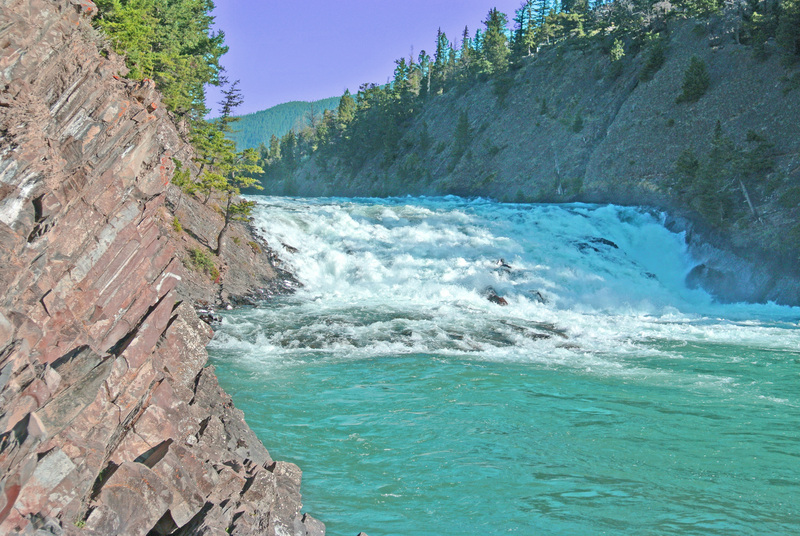 On the day we headed on to Columbia Falls we first went to the Bigfork Festival of the Arts the weather was awesome we saw many fine crafts and met some marvelous vendors. 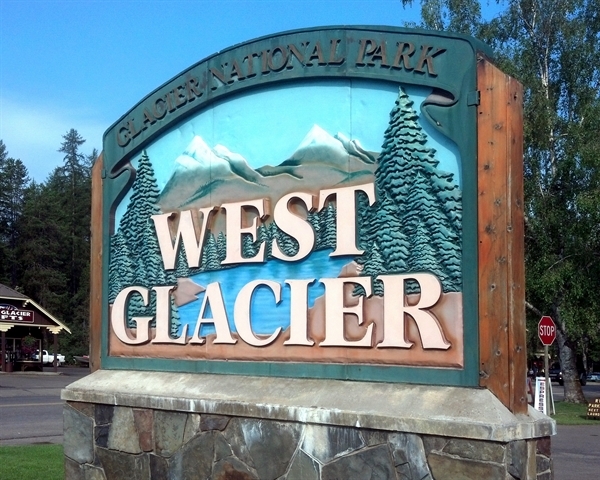 And then off to Columbia Falls which will be our base camp for visiting Glacier National Park. For those of you that checked the map, you are right, we only traveled about 18 miles. Half an hour closer will be better for exploring the park. We got all settled in here and decided to just go to the visitor center in the morning and get a better idea of how we would schedule our time. It proved to be a very good plan. With the help of a ranger and a volunteer our plan of action took shape. We had thought we would take one of the Red Bus Tours but after talking to the park rangers we decided on using the park shuttle service one day and driving on another which worked quite well for us. 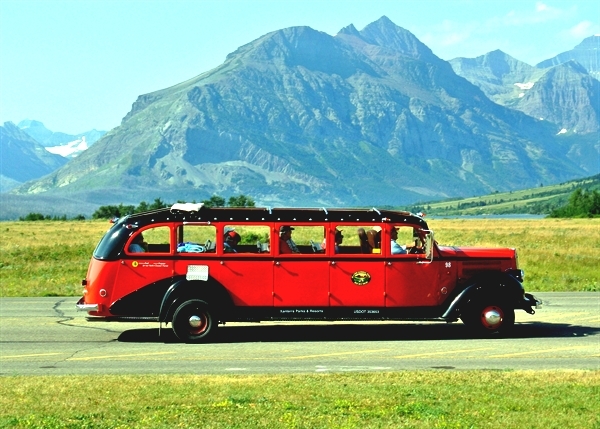 The Red Bus Jammers are actually custom made White motor coaches built around 1937 that have been converted to propane and the old (non-syncromesh) transmissions replaced with automatics. No more double clutching and gear jamming, but they are still beautiful and help relieve much congestion in the park. 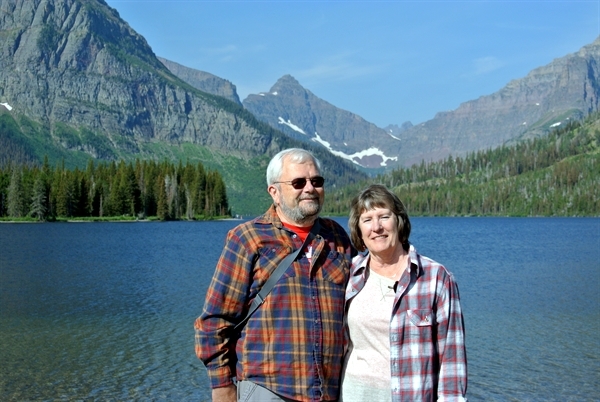 On Monday Elaine drove us around the south side of the park to East Glacier and on to Two Medicine with a stop for a short hike to Running Eagle Falls. And on to Two Medicine Lake. It was another exceptional weather day. I really believe I captured the picture postcard quality of this scene and hope you agree. Before heading back to Columbia Falls we stopped at a shop called The Spiral Spoon where we met one of the owners who shared stories and history. I would recommend taking a look at their web site / online store. It is not often that I recommend my competition but these are truly nice people with great products. 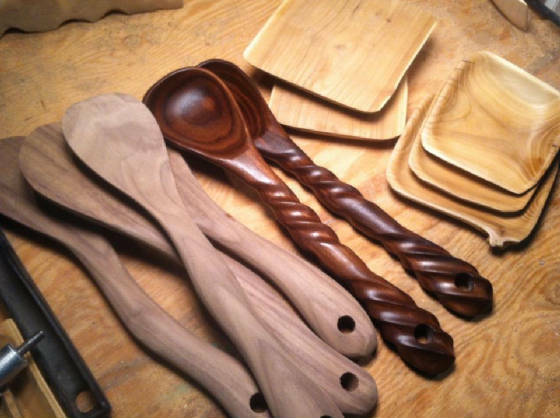 I would suggest that you check them out at http://www.thespiralspoon.com. Traveling from West Glacier to East Glacier and back on the “Going To The Sun Road” shuttle service was our plan for the next day. We were very glad that we chose not to drive. The road is very narrow with very tight turns and cliff faces up and down in many places which would have meant that the driver would have missed much of the scenery and parking is very limited. As the park ranger had warned we saw many people just driving around and around the parking lots hoping that someone would leave so that could stop. 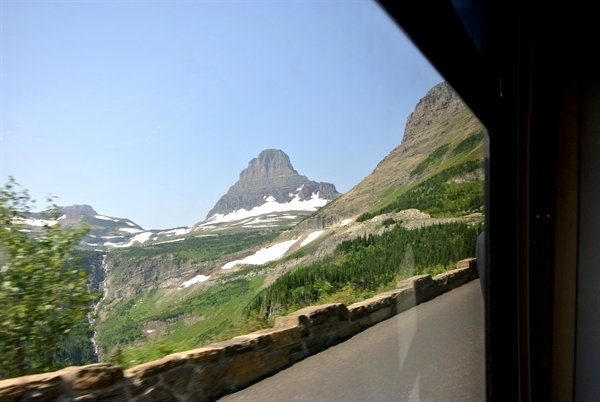 On our relaxing ride on the free shuttle we were treated to many iconic Glacier Park panoramas. 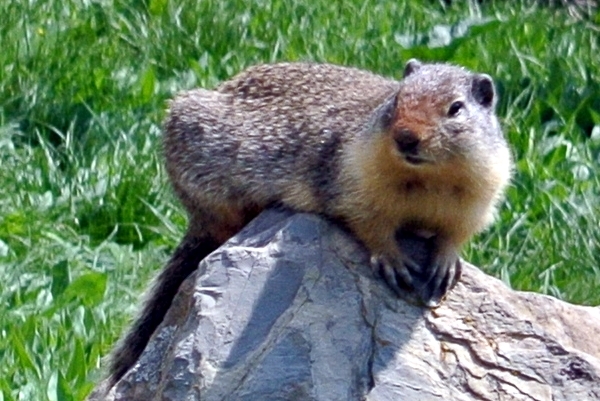 In addition to the scenery we saw deer, bighorn sheep, a marmot (Gordon wasn’t quick enough), and columbia ground squirrels. 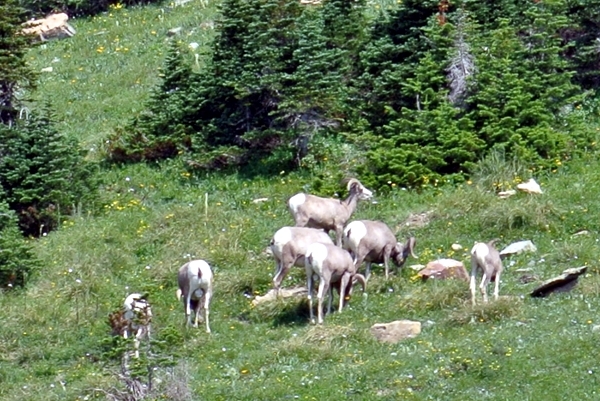 The pictures of the squirrel and sheep are from our lunch stop at Logan Pass. Toward the end of our day we stopped to hike the very beautiful Trail of the Cedars which follows a creek through a grove of red cedars. 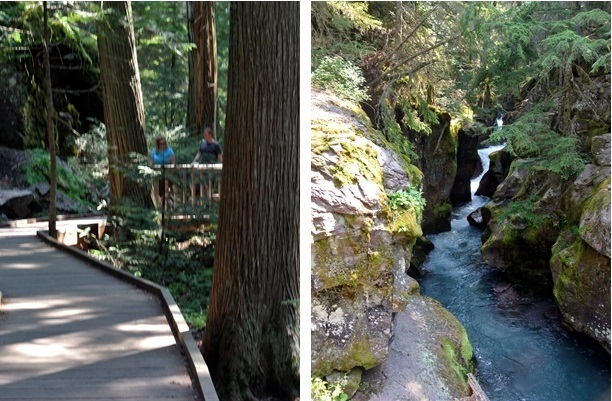 Listening to the creek while strolling the woodland made a perfect end to our day.